Ricordi first published them in 1820, where they were grouped and numbered from 1 to 24 as Op. 1, together with 12 Sonatas for Violin and Guitar (Opp. 2 and 3) and 6 Guitar Quartets (Opp. 4 and 5). 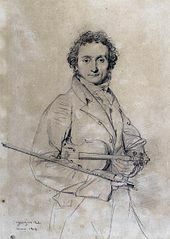 When Paganini released his Caprices, he dedicated them "alli artisti" (to the artists) rather than to a specific person. A sort of dedication can be recognized in Paganini's own score, where he annotated between 1832 and 1840 the following 'dedicatee' for each Caprice (possibly ready for a new printed edition): 1: Henri Vieuxtemps; 2: Giuseppe Austri; 3: Ernesto Camillo Sivori; 4: Ole Bornemann Bull; 5: Heinrich Wilhelm Ernst; 6: Karol Józef Lipiński; 7: Franz Liszt; 8: Delphin Alard; 9: Herrmann; 10: Théodor Haumann [sv]; 11: Sigismond Thalberg; 12: Dhuler; 13: Charles Philippe Lafont; 14: Jacques Pierre Rode; 15: Louis Spohr; 16: Rodolphe Kreutzer; 17: Alexandre Artôt; 18: Antoine Bohrer; 19: Andreas Jakob Romberg; 20: Carlo Gignami; 21: Antonio Bazzini; 22: Luigi Alliani; 23: [no name]; 24: Nicolò Paganini, sepolto pur troppo (to my self, regrettably buried). Ferdinand David's first edition was published by Breitkopf & Härtel in 1854. David, as editor, also issued an edition of Caprices with piano accompaniments by Robert Schumann. Another edition by David was issued in two books of 12 caprices each "mit hinzugefügter Begleitung des Pianoforte von Ferdinand David" (with additional piano accompaniment by Ferdinand David) and published by Breitkopf & Härtel (c. 1860). Unlike many earlier and later sets of 24 pieces, there was no intention to write these caprices in 24 different keys. 1 E major Andante Nicknamed "The Arpeggio", this composition matches chordal playing with ricochet across all 4 strings. The piece opens in E major and then quickly transitions into an E minor development section, where descending scales in thirds are introduced. 2 B minor Moderato The second caprice focuses on detache with many string crossings across non-adjacent strings. 3 E minor Sostenuto/Presto/Sostenuto Caprice No. 3 is a slurred legato exercise with octave trills in the introduction and conclusion. 4 C minor Maestoso Caprice No. 4 in is an exercise featuring passages with many multiple stops in thirds. 5 A minor Agitato Caprice No. 5 focuses on fast ricochet bowings. It begins and ends with a section of ascending arpeggios followed by descending scales. 6 G minor Lento Nicknamed "The Trill", the sixth caprice exploits the use of left-hand tremolo on the violin by quickly alternating between different notes in the chord in one of the voices. A melody is played in one line with a tremolo occurring on another. 7 A minor Posato This caprice focuses on slurred staccato passages, featuring many long slurred scales and arpeggios. 8 E-flat major Maestoso Caprice No. 8 focuses on sustaining a lower note while playing a higher melody at the same time, meanwhile incorporating many trills and double stops. 9 E major Allegretto Nicknamed "La Chasse" or "The Hunt", the violin's A and E strings imitate the flutes ("Sulla tastiera imitando il Flauto"), while the G and D strings imitate the horns ("imitando il Corno sulla D e G corda"). Primarily a study in double stops, with ricochet occurring in the middle section. 10 G minor Vivace This caprice is primarily a study in up-bow staccato, with staccato notes punctuated by chords, trills and distant string crossings. 11 C major Andante/Presto/Andante The eleventh caprice starts and ends with sections that require multiple voices, containing a passage that consists of many dotted notes rapidly jumping up and down the scale. 12 A-flat major Allegro This caprice consists of a slurred pattern of a melody on an upper string alternating with a drone note on a bottom string, forcing the violinist to stretch great distances while keeping a finger on the drone string. 13 B-flat major Allegro Nicknamed "The Devil's Laughter", Caprice No. 13 starts out with scale like double-stopped passages at a moderate speed. The second part consists of high speed runs that exercise left hand flexibility and position shifting, and right hand high speed string changing and detache bowing. The piece then repeats back to the beginning and ends right before reaching the second part for the second time. 14 E-flat major Moderato The 14th caprice displays the violin's ability to voice chords. It contains many triple and quadruple stops. Stylistically, the piece imitates brass fanfares. 15 E minor Posato Caprice 15 starts with a short passage of high parallel octaves, continuing on to ascending arpeggios, descending scales, and broken thirds. 17 E-flat major Sostenuto/Andante The "A" section contains numerous thirty-second note runs on the A and E strings that converse back and forth with double stops on the lower two strings. The middle section is famous for the incredibly difficult octave passage. 18 C major Corrente/Allegro The introduction to caprice 18 demonstrates playing on the G string in very high positions. This is followed by a rapid display of scales in thirds. 19 E-flat major Lento/Allegro assai Here are many octaves at the beginning; then there are string crossings between G and A strings; this is followed by quick changes of position on the G string. 20 D major Allegretto Caprice 20 is famous for the use of the D string as a drone, backdropping a lyrical melody on the A and E strings, imitating a bagpipe. This is followed by a rapid sixteenth note passage with trills and flying staccato. 21 A major Amoroso/Presto Caprice 21 begins with a very expressive, aria-like melody played in double-stopped sixths. This is followed by a section of rapid up-bow staccato. 22 F major Marcato Caprice 22 explores many types of double and triple stops with louré bowing, then implementing various elements of slurred staccato, slurred tremolos and strings crossings. 23 E-flat major Posato/Minore/Posato Caprice No. 23 begins with a melody in octaves in E♭. The middle, contrasting section is a formidable exercise in string crossings: it requires the violinist to play patterns of three sixteenth notes on the G string and then cross quickly to play one on the E string, and then back to the G string, all at a quick tempo. 24 A minor Tema: Quasi presto/variazioni I–XI/Finale The theme from Caprice No. 24 is well known, and has been used as the basis for many pieces by a wide variety of composers. This caprice uses a wide range of advanced techniques such as tremendously fast scales and arpeggios, double and triple stops, left hand pizzicato, parallel octaves and tenths, rapid shifting, and string crossings. In 1940, to celebrate the centenary of Paganini's death, the complete set in the arrangement for violin and piano by Ferdinand David was recorded by the 20-year-old Austrian violinist Ossy Renardy (pseudonym of Oskar Reiss), with Walter Robert on piano (78 rpm's, RCA Victor; CD reprint by Biddulph). This was the world premiere recording of any version of the 24 Caprices. Renardy had played the solo violin version of the 24 in his Carnegie Hall debut the previous October. In 1953, shortly before his untimely death, Renardy recorded the 24 again (on Paganini's Guarnieri del Gesù violin, 'Il Cannone'), in the same arrangement by David, with Eugene Helmer accompanying (2LPs, Remington R-99-146 & R-99-152). Majeske, Daniel (2LP Advent 5019-2, 1976) – Recorded September 1975 at St. Paul Episcopal Church, Cleveland Ohio | Violin: Stradivarius "Marquis de Rivière"
Especially for compositions in the form of "Variations" see the related article: Caprice No. 24 (Paganini)#Variations on the theme. ^ "Paganini: 24 Capricci per il Violino solo, "dedicati agli Artisti" Op. 1 – Robin Stowell". Archived from the original on 2015-10-02. Retrieved 2015-03-12. ^ CD Symposium 1311, review by Jonathan Woolf on "Music Web International"
^ Ossy Renardy on "the Remington site"
^ "LXT 2588 + LK 4025 – Paganini – 24 Caprices – Ruggiero Ricci". Archived from the original on 2015-04-16. Retrieved 2015-04-16. ^ This process records the original sound direct to master discs without using a magnetic tape. Thus the full dynamic range and the original sound are fully preserved. ^ Foundation, iClassical. "Pavel Berman". iClassical Foundation. Retrieved 2019-04-17. Stratton, Stephen (1907). Nicolo Paganini: His Life and Work. London: E. Shore & Co. ISBN 0-559-80636-1.